This hearse, which carried President John F. Kennedy's body after his assassination in Dallas, was sold for $160,000. A Cadillac hearse that carried the body of President John F. Kennedy to Air Force One following his assassination in Dallas was sold at a Scottsdale, Ariz., auction for $160,000. The car was sold at Barrett-Jackson auction company's annual Scottsdale collector car auction. The price does not include fees paid to the auction company, which usually add about 10%. 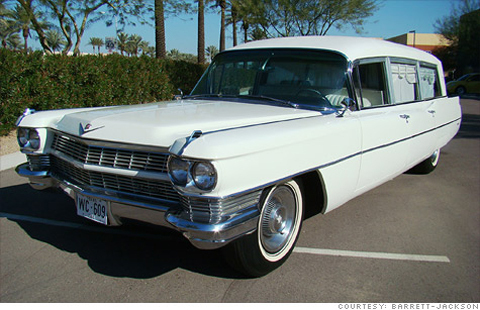 A Cadillac hearse like this would ordinarily be worth about $40,000 if not for its connection to the Kennedy assassination, said Jonathan Klinger of the collector car insurance company Hagerty Insurance. Still, the price paid for this car was surprisingly close to that paid last year for an ambulance that, while purportedly also connected to the Kennedy assassination, was saddled with controversy. That ambulance, sold at last year's Barrett-Jackson auction, was said to have carried JFK's body after it arrived at Andrews Air Force Base in Maryland. Internet discussion boards and bloggers had cast doubt on the authenticity of that vehicle, however. It sold for $132,000. By contrast, the authenticity of the hearse sold Saturday night has never been seriously questioned. "I was surprised," said McKeel Hagerty, president of the collector car insurance company, Hagerty Insurance. "I had thought this car would bring more than that." Hagerty said he had expected the car to sell for at least something over $200,000, especially considering its undoubted place in history. The 1964 Cadillac hearse was built by the Miller-Meteor Company for display at the National Funeral Home Director's Convention which took place in Dallas in October, 1963. It was later purchased by the O'Neal Funeral Home. Weeks later, on Nov. 22, Kennedy was shot and killed. O'Neal was asked to supply the hearse and casket to carry his body from Parkland Memorial Hospital to the Presidential jet. The O'Neal Funeral Home kept the hearse until the late 1960s when it was purchased by a noted hearse collector who, decades later, sold it to it the owner who consigned it for sale at the Barrett-Jackson event. The names of the seller and the buyer of the ambulance were not made public.